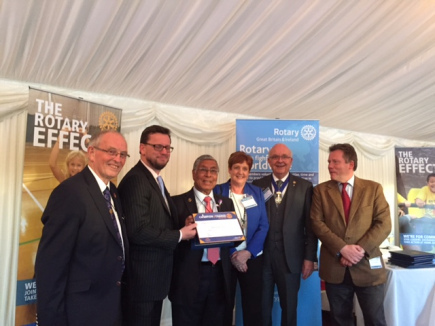 PDG Dr. Himansu Basu – Rotarian, retired Obstetrician and Gynaecologist and Programme Director of the RotCh Ch awardary / Calmed project – received a Rotary (Great Britain and Ireland) ‘Champion of Change’ award at a ceremony held in the House of Lords on the 20th April, 2016. Dr. Basu’s work in India in saving mothers and babies dying at childbirth was introduced by Rotary GBI President Peter Davey. The award was presented by Rob Wilson, MP, Minister for Civil Society, in presence of Gravesham MP Adam Holloway and Rotary South East District Governor Ray Dixon. Dr. Basu said – “I receive this award on behalf of many who gave their time and expertise in stopping mothers dying unnecessarily in childbirth in low resource countries”. The Calmed (Collaborative Action in Lowering of Maternity Encountered Deaths) programme – an innovative state of the art Rotary programme – has been introduced in two states in India (Sikkim and Gujarat), funded by the Rotary Foundation, with substantial expansion in trained workforce in the care of pregnant women and progressive reduction of maternal and child deaths.